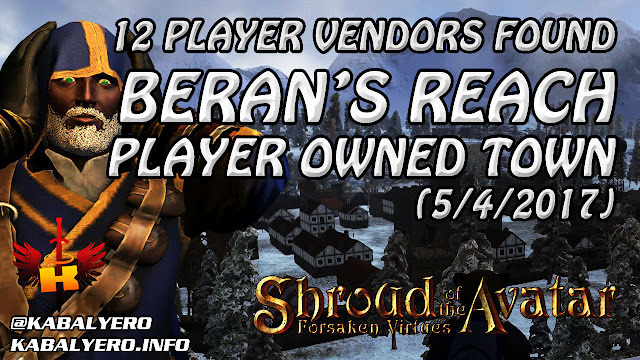 Beran's Reach, 12 Player Vendors Found (5/4/2017) 💰 Shroud Of The Avatar (Market Watch) - KABALYERO - PLAY, BLOG & EARN! It has been a few months since I last visited Beran's Reach and checked the player vendors in this player owned town located just north of Central Brittany. I found 12 player vendors in Beran's Reach. If I missed any player vendors then I apologize. To see all these 12 player vendors, simply watch the video below.